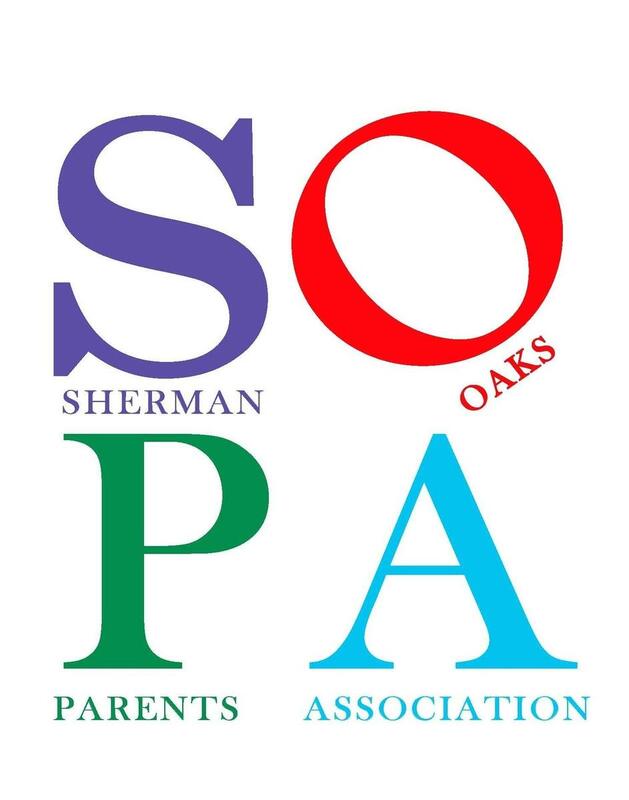 Sherman Oaks Parents Association (SOPA) is a non-profit corporation made up of families and supporters of Sherman Oaks Elementary Charter. The state of California and LAUSD currently do not pay for a complete, well-rounded education when it comes to art, music, physical education, science, technology, and other extra-curricular educational opportunities. It is SOPA’s mission to fill in the gaps and provide enrichment opportunities for the students of SOEC. -Volunteer Services – SOEC depends on our parent and community volunteers. From our renowned Paws and Go program to our dedicated classroom volunteers and room parents, all of the special events/services SOPA provides rely on your involvement. -Before & After School Programs – SOPA’s services are not just limited to the school day. If you need child care before and/or after-school, SOPA’s Kids Center can help you out. We also offer Homework Club one hour per day, Mon – Thurs, for students to do homework at their own pace. Finally, we offer 3 sessions of Super School extracurricular classes of various activities and interests. How do we do this? These vital programs are paid for by SOPA through donations from all of us. Revenue is generated from donations to the SOPA Tiger Fund, from various fundraisers throughout the year, and through business partnerships made possible by our Great Neighbors and Event Sponsorship programs. SOPA encourages you to become actively involved by staying informed, volunteering, participating, and donating. SOPA invites you to attend monthly SOPA meetings. Meetings are usually the last Tuesday of the month at 6:00 pm in the school library. Please check the calendar for exact dates of meetings, as some do move to other nights. The meetings begin with entertainment from one of our classes followed by a free, catered meal for all parents, donated by a local restaurant. Children are welcome. Free babysitting is provided in the cafeteria during the meetings by our professional Kid Center staff. Your children will enjoy a movie and pizza donated by Domino’s while you receive important SOPA information and updates about school issues. There are so many opportunities to assist SOPA. Whether you help out with Paws and Go, become a room parent, chair a program, attend a beautification day, or volunteer at an event; there is something for everyone no matter the restrictions on your time. To find out about ways to volunteer for SOPA, please attend a SOPA meeting, visit our Volunteer page, or email a SOPA board member. Help SOPA make our school great! Throughout the year SOPA sponsors many events including the Ice Cream Social, the Halloween Carnival, PJs and Books, the Spring Gala (adults only), Movie Night and more. These events are not only fundraisers that financially support the programs that enrich our school but also bring us together as a community. When a SOPA event comes around, please participate and encourage friends and family to come too. It’s amazing what we can accomplish when we all come together. The faculty, facilities, and enrichment programs that SOPA provides are only possible with your financial support. Please give generously to the SOPA Tiger Fund – click here to Donate Now. Our goal is to have every family contribute, whether it be $10 or $10,000. SOPA does offer donation levels that come with gifts to you, but at any level of donation you get the greatest gift of all—knowing you are helping to enrich our children’s education. We thank you for your support. If you have questions about SOPA, please email us at info@shermanoaksparents.com.